I used Julee's Anni-VERVE-sary Sketch, AVS203. 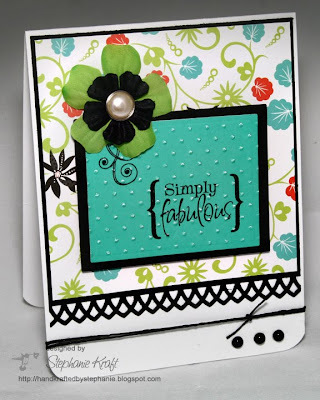 Accessories: Rectangle Nestabilities (Spellbinders), Swiss Dots embossing folder, Cuttlebug (Provo Craft); Arch Lattice border punch (Martha Stewart), Corner rounder (Marvy), Rhinestones, Flowers (Prima, Bo Bunny), Pearl Brad, Waxy Flax, Foam Tape. so gorgeous!! Love the colours you have used! Its very striking!